Legendary Iwamoto wide-field 20X hand lens. Superior to all other 20x hand lenses in optical quality and field of view. Fully corrected for spherical and chromatic errors through a three glass lens optical system. Chrome plated frame with leather case. Focal Diameter 9/16" (16 mm), Length 3/8" (10mm), Focal Length 10-12 mm. Made in Japan. 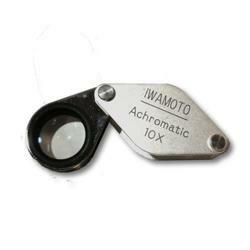 This high quality magnifier features superior optical quality, a 9/16" (15mm) lens diameter with 10X magnification. Fully corrected for spherical and chromatic errors through a three glass lens optical system. Chrome plated frame with a leather carrying case. Made in Japan. Hastings Triplets, the finest hand lenses made by Bausch & Lomb, are highly corrected for spherical and chromatic aberration. Their compound lens is formed from three separate lenses bonded together and provides very distinct images with no color distortion. A swing-away, nickel-plated case protects the lens and serves as a handle. The Bausch & Lomb Coddington lenses are second only to the Hastings Triplets in performance. They have a single thick lens with a central diaphragm to limit optical errors. Like the Hastings, they have a swing-away nickel plated protective case. High quality 10X Triplet hand lens, highly corrected for spherical and chromatic aberration. The compound lens is formed from three separate lenses bonded together and provides very distinct images with no color distortion. Small leather case included. Lens diameters are 18mm (11/16"), which is slightly larger than the 10X Hastings Triplet, above. Hand lens has swing-away chrome finish metal case that protects the lens and serves as a handle. 10X triplet hand lens illuminated by six imbedded white LED's for optimum viewing under all light conditions. 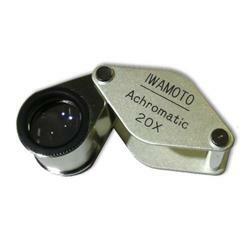 Top quality 10 x 21mm glass optic lens is corrected for spherical aberrations, for undistorted field of view to edge of lens, and corrected for color distortions, for true color viewing. Built-in band of six LED emit a cool bright light. All metal construction with aluminum lens housing. Includes a leather storage case. Opened hand lens is approximately 3 inches long, which is about twice the size of the 10X B & L Hastings Triplet. 10X triplet hand lens with six imbedded white LED's, for optimum viewing with white light, and one UV light set into the base for viewing fluorescent minerals. Same top quality 10 x 21mm glass optic lens as in LED hand lens (above), which is corrected for spherical aberrations, for undistorted field of view to edge of lens, and corrected for color distortions, for true color viewing. All metal construction with aluminum lens housing. Includes a leather storage case. Neck lanyard of the finest soft cowhide, with single or double split ring to securely hold hand lens(s), made by Gfeller Casemakers. Lanyard ring will fit only Hastings Triplet and Coddington lenses. Low cost doublet magnifier featuring 10X power and 9/16" diameter lens which folds into a chrome plated metal holder.